This is particularly true for older black and white film, before an age of television when the films could only be shown on the big screen. 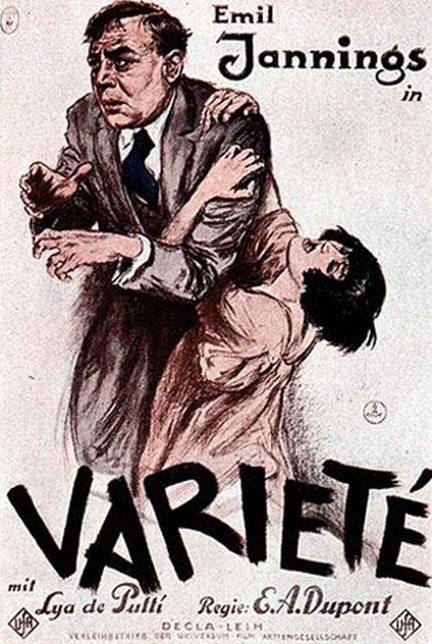 There are interesting differences in the black and white films of the early 20th century as opposed to the modern film and it's always a lot of fun to watch and connect with that history of film. Thus, when The Cabot, a local historical theater in Beverly, Massachusetts offered up the 1925 film, Varieté, I was excited to watch a silent black and white film on the big screen. I knew nothing about the film. I only knew I had a free Friday night and the show would be a good activity. However, this was no mere showing of the film. The soundtrack for the film was to be provided by the Berklee Silent Film Orchestra (BSFO). Yes, there is a silent film orchestra and they are absolutely fabulous! The orchestra stems from a film-score course at Berklee wherein students find a silent film and over the course of the semester create a film score for it. They do not listen to the original score but rather work hard to come up with a score that embodies what they see happen throughout the film and they did an amazing job, coming up with 90 minutes of music and sounds that perfectly captured the film's mood, actions, and themes. The film itself is a fascinating film in terms of its cinematography and aesthetics. It follows the antics of an acrobat who leaves his wife for a newly acquired (literally) love, only to lose her to another acrobat and thus feels compelled to murder the other acrobat. The plot is problematic to say the least as the violence towards and possession of women is problematic (e.g. he has no issue leaving his wife and child for a woman he essentially owns but has fault with her leaving him; she is raped by the second acrobat but somehow this encourages her to fall for him) feels beyond antiquated but outright barbaric. Looking beyond that (as hard as it may be), the cinematography is quite impressive for a 90-year-old film. The use of camera angle, the capturing of the acrobatics, and some of the inventive shots and pans were fascinating. Equally, this film as much as Nosferatu and many other classic silent films captures the power of the silent film in the sense of how much it could convey with only a handful of title cards. But the BSFO made the movie absolutely magical. Its power was in its almost entire absence. 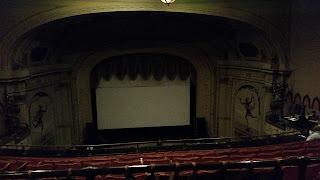 As I sat in my seat in the mezzanine seat (more on that later) and could not see them, it was often hard to remember that I was actually listening to live music in an old theater. Their music for all ninety minutes of the film blended seamlessly with the film and added such a strong ambiance that throughout they felt as part of the natural landscape (soundscape?) of the film. The only times I was drawn to their existence was when the audience would break out into applause at their work (not entirely sure when this happened but it might have been at the switching of conductors or clear pauses in their performance). A picture of the Cabot theater from the upper mezzanine level. Besides the amazing music, something else made the cinematic experience so transcendent and magical. I opted to buy tickets in the upper mezzanine at The Cabot. I've been to many events here but never when the mezzanine has been opened. I opted for the mezzanine because I thought it would be cool but also, the upper mezzanine (think: partial nosebleed) was also cheaper (not by much). But these were the perfect seats. I still saw the film perfectly but I also felt enveloped in the theater in such a way as I rarely experienced before. I love the new theaters with their comfortable, spacious and reclining seats. 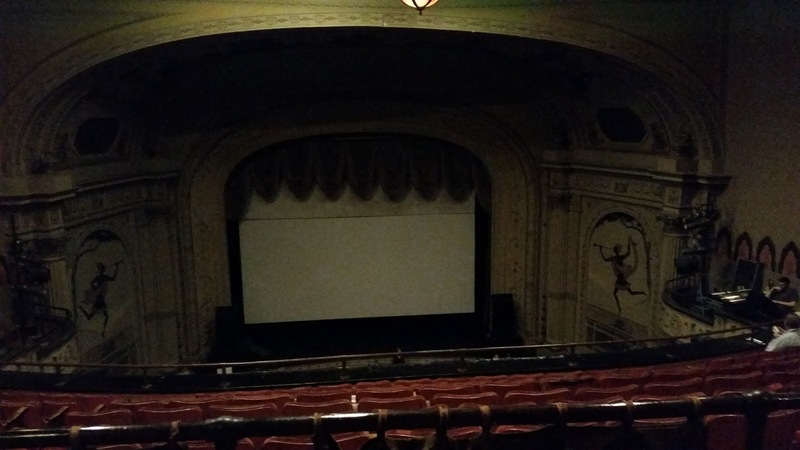 But sitting in the mezzanine section with few others lost in a beautifully restored and visually-well constructed film with amazing live music--it was something I won't soon forget and wholly had not experienced until this point. The next time The Cabot does this, I will most definitely be there. I hope to see you there too!